If you’ve been alive for more than 7 minutes you know that life is a series of highs and lows, good and bad, adventure and monotony, abundance and scarcity, mourning and celebrating … and everything else in between and beside. 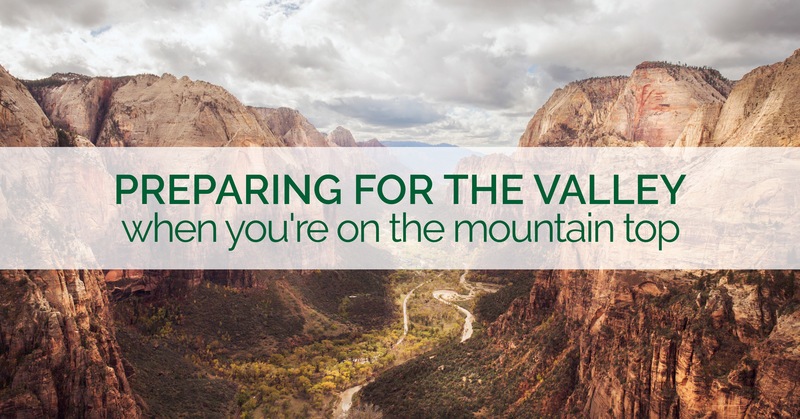 In the knowledge that hard times have been and will come, an expression of our growing maturity and self-leadership is how we might utilise our ‘mountain top’ times to prepare us for the ‘valleys’. Often a ‘valley’ experience can lead us to question. Where is God? Why is He ‘doing’ this to me? What have I done wrong? But in our mountain top moments we can work to establish a solid sense of God in everything, an understanding of how He works; a trust in His heart and activity towards us that is not altered by our circumstances. A robust faith includes a way to see suffering and trials. It includes a way to interpret God’s blessing and provision that is equally applicable for us in a Western culture as it may be for someone living in a developing nation or less privileged circumstances. How do you answer the question “why do bad things happen to good people?” Because if you can answer that in your seasons of rejoicing, those truths might just sustain you when the mourning or challenge comes. What we sow into our life and heart by way of disciplines in ‘easier’ times becomes the well we draw from in the more difficult seasons. Disciplines such as prayer, praise, gratitude, mentorship, giving, reading the Bible and journaling have varying parts to play for each of us in the intimacy of relationship we experience with God. Through these things we learn to know His voice and be sure of His presence. In difficult times the ease with which we turn to God or can hear or see Him above our circumstances will be enhanced by what we have sown in our mountain top moments. When we see someone travelling through that kind of valley we would do well to learn from it rather than repeat it ourselves. What choices did they make? What outcome of a decision or action had they not anticipated? What responses have they chosen in the valley that seem to have extended the time they’ll spend there? From our mountaintop view we can have a clarity of a valley experience that can fuel better choices and proactive processing that might allow us to avoid that season altogether. A lesson learned from someone else’s pain and difficulty is a lesson well-learned. Of course, each of these things can (and must) be done even when we are IN the valley. But the energy and intentionality we invest in our ‘mountain top’ moments can dramatically impact the length and depth of those ‘valley’ experiences. How about you? What have you sown in the mountain top seasons that you’ve found bearing fruit in the valley experiences? What disciplines or practices have you employed to sustain you in faith and joy when the valley moments come?